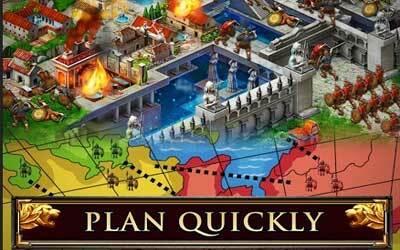 Previous version Game of War – Fire Age 3.26.541 apk for Android will help you to downgrade or install older app easily. This is one of the best Strategy apps. Since it has a multiplayer mode, there is social element here. Multiplayer feature allows you to interact with the other players. You can use the live chat feature for this. Asking questions or building alliance can be made easier thanks to this. In term of design, the game looks pretty good. Maybe you cannot expect for a high resolution and a high detail graphic, but you can expect for a good gaming experience here. The user interface is easy to understand too. The gameplay is also pretty similar with the other strategy games. If you ever played a strategy game, you will be familiar with it. This game runs well on Android 2.3 or higher. There is no specific specification to play the game as well. But running the game in the high specification smartphone will truly give a better gaming experience. Lag will never be experienced anymore. Game of War – Fire Age is available for free. The size is also pretty small. It is about 35.61 MB only. If you want to play it, you can install the game from the reliable app store. Attack & conquer the Wonder to become the almighty Emperor! Use your power to give special titles to your friends & enemies in the Kingdom! Game is alot of fun. Playing over a year growing every day! You do not have to spend money to play and enjoy the game as well as the people.